CELEBRATIONS of the 300th year of the foundation of the Khalsa Panth which began at Anandpur Sahib with great fanfare come to an end in a few days, with the exhibition of Sikh relics at the National Museum. Credit for initiating celebrations on so grand a scale goes to Chief Minister of Punjab Prakash Singh Badal. I shudder to think of the enormous amount of money spent on the occasion and hope something of lasting value will remain for posterity. There will be a new township with its museum, picture gallery and emblem of the two-edged dagger (khanda): Anandpur in addition to being a place of pilgrimage will become a tourist attraction. Unfortunately though Badal and his faction of the Akali party deserve plaudits for getting the Khalsa world-wide attention, its wrangles with the rival group led by Tohra and the acrimonious exchanges between the Jathedar of Akal Takht and Bibi Jagir Kaur, president of the SGPC, over purely academic matter of the choice of calendars have created the impression that Khalsa mindset is still of the Middle Ages. Hukumnamas are issued from Akal Takht just as fatwas are pronounced by Mullahs. Muslims ignore them, and even the Sikh masses treat hukumnamas with disdain. What will future generations know of the Khalsas tercentenary bash? A large number of books were published or re-published on the Sikhs, their religion and history: four volumes of The Sikh Encyclopaedia, compiled by the late Professor Harbans Singh, new books by K.S. Duggal and Patwant Singh. Less noticed but those that deserved attention were translations of Guru Gobind Singhs Akal Ustat (Praise of the Immortal) and Zafarnama (epistle of Victory) composed in Persian and addressed to Emperor Aurangzeb by Darshan Singh, former diplomat who retired from the IFS a couple of years ago. Darshan Singh, born a Hindu, is an example of the tradition followed by the many Punjabi Hindu families of bringing up their eldest son as a Khalsa Singh. (When all other means have failed, it is right to draw the sword out of the scabbard). It so happens identical lines are attributed to Shaikh Saadi who lined much earlier than Guru Gobind Singh. Some historian should unravel the mystery. To tell the truth without any fear. "Prophet, poet, soldier, and philosopher", writes Darshan Singh of the last Guru. In the short span of 42 years of his life Guru Gobind crammed writing (he gave the final shape to the Adi Granth as well as compiled the Dasam Granth); he fought an unceasing war against heavy odds till he was assassinated at Nanded (Maharashtra) by two Pathan brothers he had taken under his protection after slaying their father in battle. He was truly a most remarkable man who besides being a poet of great merit, fired supine people to become a nation of warriors. A bearded, long-haired Sardar dancing Bharatnatyam! Preposterous! For one this dance form is essentially feminine and Tamilian. Ram Gopal was the first to break through the gender barrier. Since then many male dancers have made successful intrusions into this female domain. Navtej Johar is the latest. I was reluctant to see him perform till a few celebrated dancers  not famous for saying nice things about others in the profession, told me he was good. So accompanied by two lovely women, Kishwar Ahluwalia and my daughter Mala, I turned up at the Habitat Centre. All three of us were let in, courtesy Sunil Mehra who had organised the show. I was lucky to find myself seated on the same round table with Yamini Krishnamurthy (Bharatanatyam) and Uma Sharma (Kathak). It was an open-air courtyard. Facing me was a screen showing a chiaroscuro of scenes of Sunil bathing baby elephants in Sri Lanka, dancers, including Yamini and Uma. A few feet away on the floor were a troupe and mridangam and drum player and a singer making up Navtejs small orchestra. The atmosphere was very relaxed: no one was in a hurry, everyone knew everyone else. Scotch, wines and canapes were served. Fortunately Sushmita Didi who grew up with Navtej filled me up by his biographical details. "He is one of our boys in Chandigarh", she began. "He was born in Jalandhar but joined college in the union territory. Father, a civil servant, mother a homely housewife. He was active on the state and acted in many street plays. Then he took to dancing. His father was dismayed. Dancing did not go with a Khalsa Sikh. He tried to divert his interests to painting. But the dance bug had got into the boys blood-stream. He continued practising it on the sly. No sooner he had taken his degree that he went off to Chennai and joined Kalashetra. Thats where he picked up the necessary Tamil and mastered Bharatanatyam. He spent some time in Kerala and was charmed by the Malayalis and their ability to combine martial arts with song and dance. From Chennai, Navtej proceeded to New York to be exposed to modern western dancing. He found no difficulty in adapting himself to it and at times nursing the essentially oriental to the current-day occidental. At long last Navtej entered the open courtyard to a round of applause as theatre lights beamed on him. He is a slim Sardar with not an ounce of extra fat or muscle: he practises yoga. He has his long hair tied in a bun at the back of his head, beard intact, kada on his right wrist. He was bare to his waist, with the lower half of his body draped in a white dhoti, ghungroos round his ankles. The dance began. I could not comprehend abhinaya and turned to my dancer friends for explanation! "He is very clean, very good", said Uma Sharma. I did not understand what she meant. I tried to ask Yamini Krishnamurthy later but failed to get her on the phone. 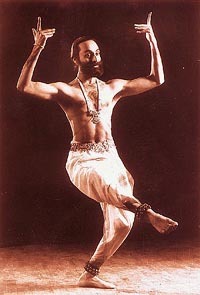 My own judgement, for whatever it is worth, is that Navtej Johar has arrived as a first-rate male dancer of Bharatanatyam. He will hold the Indian stage for many years to come. When the great orator and statesman, Edmund Burke, was in Parliament, he once had the occasion to make a spirited and animated attack on Warren Hastings, the Governor-General of India. In the midst of the speech an admirer of the object of Burkes wrath rose to his feet and interrupted the speaker. Burke turned on him viciously. "Am I", he asked in great indignation, "to be teased by the barking of this jackal while I am attacking the royal tiger of Bengal?" (Contributed by Judson K. Cornelius, Hyderabad).